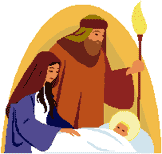 This is one of our free cross stitch patterns named Jesus, Mary & Joseph, a beautiful pattern that would be great for your Christmas and Christianity-related cross stitch project. Each of our pattern conveniently includes a color key and sheet. If you use one of the free cross stitch patterns from CrossStitch4Free.com for a project, feel free to contact us and include a picture of your completed project to be included in our web site. We feature other free cross stitch patterns related to special occasions and holidays. Click on the Related Keywords below this page to view all cross stitch patterns based on the keyword you selected. Our full list of cross stich patterns can be obtained by using the navigation menu above this site. Contact us if you notice any broken link, corrupted file or other discrepancies in our site.